Today's word is the elementary "houden van", which can also be applied in a non-romantic context, for example when talking about food. – "Ik hou van jou!" – "Maar… Hou je dan niet meer van me?" – "Hier, neem maar een hapje!" – "Nee bedankt, ik hou niet van witlof." – "Zij houdt heel erg van sla!" – "Ga je nog skieën dit jaar?" – "Misschien, maar ik hou sowieso meer van snowboarden." – "Lekker vinden": to find something tasty (in this context). – "Als kind vond Sander witlof niet lekker." – "Gek zijn op": to be crazy about something/somebody, to (really) love something/somebody. – "Ik ben gek op chocola!" Could you please explain what is the difference between houden van, lusten, geven om and willen. I know they all mean like but in what sense each one. Irini, this is a good question, thank you. We will try to answer it soon. How about “Ik zie je graag” as a related expression, or is it only used in Belgium? “Ik zie je graag” in the meaning of “I love you” is only used in Belgium and I am not sure if it has the exact same meaning (Flemish people are invited to comment). In the Netherlands it is not used that way, in fact people would understand it as “I enjoy seeing you” which is of course not the same thing (and you would not use this expression to say that). ik zie je graag means the exact same thing as ik hou van je. I’m from Mexico, currently studing Dutch, as I really like your language and country. For me it was funny to find out that “houden van” is not of frequent basis. In México, we use love expressions (“te quiero”, “te amo”, “te adoro”, etc…) all the time. I’m in trouble with the word “sowieso”. I just can’t figure out when I should use it, and I hear it used all the time everywhere. bedankt! 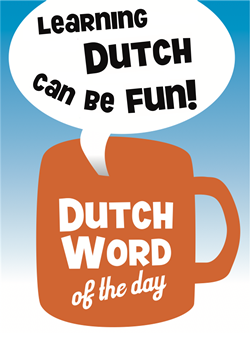 strange that I consider a word that comes from German so important to give to my Dutch a real “Dutch touch”!